It’s true what you may have heard…Prince Edward Island is a golfer’s paradise. There are many, many world-class golf courses here on the island, a number of them in the Cavendish area. Lots of visitors we welcome to our province come here for the golf. I personally have not done much (read: any) golfing, though it is something that’s on my goal list for this summer. Unless you count miniature golf because I have played a lot of that in my day. Mini golf is fun. And a lot more affordable for a family than the traditional version of the game. One thing I’ve learned about mini golf over the years is that it is definitely more enjoyable in a group setting. 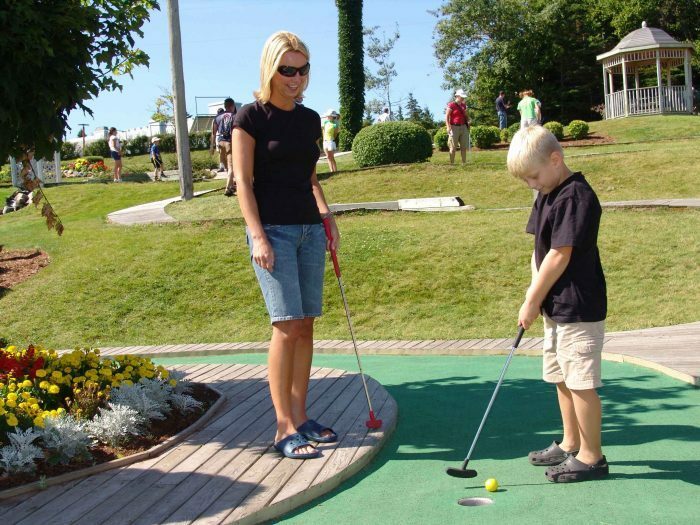 If you’re hosting a birthday or anniversary party, a reunion, or some sort of big gathering this year, how great would it be to offer something different by hosting a miniature golf tournament? A mini golf tournament can be as simple or as elaborate as you want it to be…mostly because you’re essentially making it up as you go along. That being said, here’s a little bit of inspiration to set you on your way. Because all of these courses are so close to one another, you could play all of them, or a combination of them, and make a whole day of it! After you’ve chosen your location, it’s time to invite people. This can be an old-school invitation in the mail, but let’s face it…nobody really does that anymore, do they? More likely, you’ll slap up a Facebook event, invite some people, and ask them to pass along the invite to anyone who isn’t on Facebook. Be sure to let everyone know the location, the style of the event, what they need to bring, and where everyone is meeting up. After you have your invite list nailed down and know who’s coming, it’s time to organize teams. If you like, you can leave it up to everyone to choose their own team members (if this tournament is happening as part of a family reunion, you may naturally break up into smaller family units), but it might not be a bad idea for you (the tournament planner) to organize teams. After the teams are created, encourage everyone to come up with a fun team name (personally, I would go with Angry Birdies) and assign an official team scorekeeper. 4. Decide on your start: shotgun style or tee-off time? There are a couple different ways you can run your tournament. Option 1: Every team is given a tee time, which seems like a terrible idea if you have kids involved (unless you put the teams with kids up early). Option 2: You go with a shotgun start—every group starts on a different hole so there’s less waiting around, making this a favourable option if you have kids or any other types of impatient people (me). Who doesn’t love prizes? You don’t have to go terribly exorbitant for your mini golf tournament prize purse, but you can have fun selecting little things to give away for best score, best dressed, friendliest player, worst score (raises hand), etc. Think of things like a free frozen yogurt, a canteen treat, Cavendish souvenirs, movie passes…this is really pretty wide open, so be creative! You can get a trophy made up pretty inexpensively these days, or…make your own (cough couch Pinterest cough). You could also repurpose an old trophy that’s collecting dust around your home. Any household object could become a trophy, really. You could even go to a thrift store and find your own version of the esteemed green (gables?) jacket! If you’re planning to make your mini golf tournament an annual thing, this could become a highly coveted part of the event. Great for photos you’re sure to cherish, too. 7. Prepare golf themed snacks. Is anyone else getting kind of excited about the idea of a mini-golf tournament? I know I am! Jaime Lee Mann is the author of the popular “Legend of Rhyme” series of fantasy novels for children. She lives in a pretty house in Morell, Prince Edward Island with her husband and their two daughters. She writes every day and will continue to do so as long as people choose to read her words.